Winter is here. The time when opportunities for young people were rich as summerwine is over, and many are struggling to get a solid grip on the first rung of the job ladder. Granted, it’s not an evil incestuous duo like the Lannister twins pushing them off towers or standing in the way today, but reaching that ‘big break’ is as elusive as getting a kind word from Cercei. Only 24% of employers took on a young person directly from education in the last two to three years. That leaves a lot of young people like Jon Snow, with no other option but to sign up to be a crow at the Night’s Watch, aka claimant at the Jobcentre. And the barrier between young people and getting vital skills and experience is as hard to scale as the great Wall itself. Experience is the key to victory, and employers cite a lack of it is as the main reason for not recruiting young people. This creates a circle as vicious as a direwolf, where you can’t get a job without experience, but can’t get experience without a job. And it’s hard for young people to build experience and skills today, as even the ‘small breaks’ have become harder to reach. There has been a decline of Saturday jobs, meaning no more working in the castle kitchens or the blacksmiths at the weekend. Plus only 27% of employers offer work experience. How is anyone supposed to become a good swordsman if you don’t offer them training? A good seamstress if they haven’t been taught to sew? Or a good King without having the chance to gain any experience? The tyrannical King Joffrey is a case in point here. We must allow young people to get a proper experience of work in an environment where they can learn, or the next generation of workers and leaders could end up being under-skilled and under-supported (though perhaps not sadistic, like Joffrey). We must also challenge the preconceptions people have about the youth of today, as young people bring incredible benefits to businesses. Take apprentices for example, as 92% of employers who employ apprentices believe they lead to a more motivated and satisfied workforce, plus the average apprentice increases business productivity by £214 a week. That could buy you a nice dragon egg. Speaking more generally, young people like Daenerys bring other massive benefits, like a fresh perspective on old methods and the help to enter new markets. Plus they bring commitment as strong as her dragons’ loyalty. Unfortunately, young people can have all of Tyrion’s wit and knowledge, and still end up counting pennies because these positive messages aren’t being spread widely or loudly enough. We need to make the benefits of helping young people into work clear, because today there are 920,000 unemployed young people in the UK, which is around one fifth of their age group - that’s the equivalent of one of the Stark children, one of the five Kings, or one of Ser Jaime’s remaining fingers. Young people in the UK are struggling, and if you’re an employer you have the power to help them help your business. 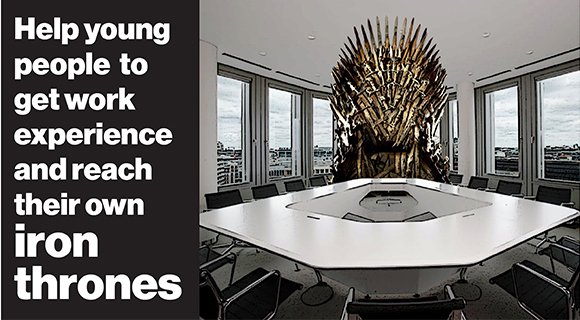 Help them to get experience and reach their own iron thrones in the boardroom. Find out how here. I am a lot older than you so have seen and expereienced the 2 sides of the story. firstly one of the main reasons for us not employing youngsers and giving them training is the minimum wage. For years when you went for a job you were offered it with the minimum the company descided they could afford take it or leave it.. After all they were expectedto train the new employee so that in mayby a few years they could, if they decided move on and take the new skills with them or as hoped stay with the employee out of loyalty and the wages which would have increased yearly while being trained. Now to illustrate, you can join the post office as a mail man and get the same wages as a mail man who has say worked at his job for 20 years,, is this fair I dont think so.Also shall we say interviewing school leavers "not your graduates"
You will find that they cannot add, subtract ,do fractions even hold a conversation, mainly due to Mobile phone "twittering" and all the other brain numbing things that take up most of there time. Sadly we have a large proportion of youngsters who are unemployable. Can we blame the school system, yes, how on earth if they do not learn them the alphabet , times tables , a basic grasp of the english language etc,etc do they expect to be employed. I could go on for ages but being someone who left school at 14 and now been self employed for 40 year i have always been glad i had the one thing that has been the most valuable to me "comman sense" something that is sadly missing in todays youngsters. And no i do not class them all the same but a large majority. Is ther hope ? mayby someone can tell me ,i dont see any. Well I must say James what a scathing view you give of the younger generation. I accept a percentage leave school without the basic life skills however this is a tiny amount and the vast majority are quite able to add, subtract and hold a conversation. If I think back to when I left school with no experience of work, perhaps only limited conversation skills and a job market which resembled today. It took time but someone eventually gave me a chance and I've been in employment since. I do agree the cost for an employer to train a school leaver to a suitable level can be a problem especially to smaller companies although the minimum wage argument does not hold because below the age of 21 has 3 scales £5.03, £3.72 or for apprentices £2.68. With regard to the schools, then yes, I do think they could do more but perhaps this needs to come from government but preparing a student for work is more than a string of GCSE's it's attitude, expectation and developing a work ethic. Finally, the one thing we should all be conscious of is that the school children of today will be paying for the pensions of us 50 something year olds tomorrow. Perhaps with this in mind we may be able to give them more help and encouragement.